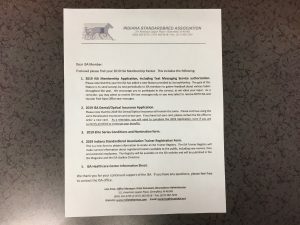 The Indiana Standardbred Association mailed out 2019 Membership Packets Thursday, Feb. 21, 2019. The packet includes all the vital information for members for the upcoming racing season in Indiana. Included in the packet is a 2019 ISA Membership Application, including Text Messaging Service Authorization. Other information in the packet included ISA Dental/Optical Insurance Applications, 2019 Elite Series Conditions and Nomination Form, 2019 ISA Trainer Registration Form, and the ISA Healthcare Center Information Sheet. All information is a “one-stop” shop to provide members with easy enrollment, renewals and information regarding the 2019 racing season. For more information about items in the ISA Membership Packet, contact the ISA Office at (317) 462-6616.